Arguments can be made that this is Greg Mattison's defense--which historically have been a significant upgrade from those that he inherited--rather than Hoke's, but regardless of who this can be attributed to, it's clear now that for the foreseeable future, the defense will be what this program intends to hang its hat on. Caveats apply for this game: Minnesota truly is the worst team in the FBS. They were starting a freshman quarterback who was in over his head. And the skill position players lack the ever-important "skill" that is so preferable for that personnel. This was, however, the first shutout since the Carr years--even crash test dummies Delaware State were able to put points up against Rodriguez's defense. For all of the (mostly regrettable) This Is Michigan posturing, this game felt like a Michigan football game against a significantly inferior opponent: smothering defense that played near flawless football and executed exactly how they were supposed to. There were no blown coverages that we look at on film and say "They'll get that ironed out during the season." There were no glaring weaknesses that could be exploited, either. Michigan put in their backup quarterback in the third quarter and found playing times for the likes of Richard Ash who, but all accounts, has no business being on the field this season. With Borges making the proper offensive adjustments and largely scrapping his traditional playbook to accommodate the skill set of Denard and Co., and the gawdawfulness of the Big Ten, forget anything I said preseason. Michigan's new ceiling should be recalibrated to account for the obvious upgrade on the coaching staff and their Little League schedule in the Big Ten. Michigan has a real chance to have a banner year this season. Al Borges ftw. The changes that he's made to his offense are nothing short of revelatory. It's clear that he understands offense, not just his offense. The way he tweaks his schemes (in this game, the use of the QB stretch counter, which I'll picture page this week) is the most clear indication that this coaching staff is not only intelligent but will be successful over the years. Borges has found the offense's strengths and opposing defenses' weaknesses and exploited them. Denard looked much improved. His accuracy was certainly better in this game, which may have been a result of the operation he recently had on his throwing elbow. But it is also likely due to a tweaked offensive structure. We didn't see Denard taking shots downfield in this game, and most of his passes were short hitch routes and simple reads. We'll see if this is sustainable against a defense that isn't a smoldering crater. Vincent Smith now has stats in the "Quarterbacks" column of the stats page. Borges had fun in this game. Blake Countess might not be mirage. He appears to be a young cornerback that can, like, totally cover people. This is a good thing going forward. Roy Roundtree is officially a non-factor in this offense. This doesn't really surprise me (he's not an outside receiver and he doesn't have the shake from the slot that some of the other guys do), but it is disappointing after his year last season. 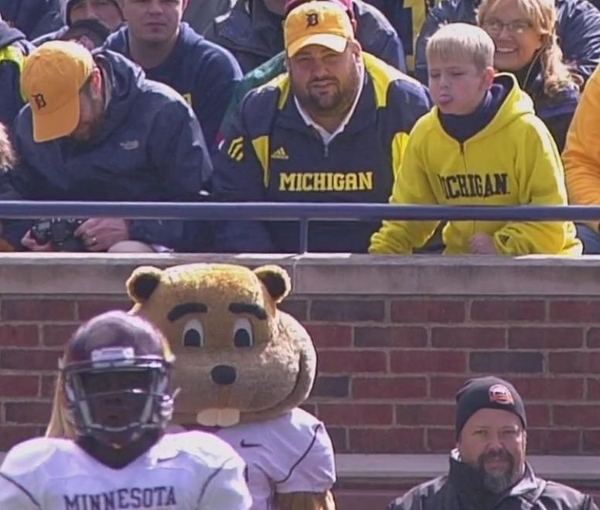 Though Michigan nominally opened the Big Ten season against Minnesota, well, no. Next week's game against Northwestern will be the team's first real conference test. With ongoing injuries to Dan Persa, that game suddenly looks a lot more winnable. "Though Borges is doing well with this offense, it's still a downgrade from Rodriguez's spread and shred." Rodriguez's spread and shred got Denard knocked out of 10 games last year. Don't forget that. Personally, I got tired of watching our backup QB regularly finish games last year. Nothing about Rodriguez's offensive structure got Denard injured. Countless teams run similar offenses without their QBs getting injured. That's not something that can be held against RR. Rodriguez's offensive structure allowed teams to key on Denard, because his offensive structure was incapable of coaching any running backs to take the load off Robinson. I would agree that it was not the scheme, but rather failures in coaching, that saw Denard hurt so much. Both scheme and coaching are part of the offensive structure, though. This year's offense may be a step back. They have played better teams than the 2010 offense had at this point, but have scored fewer points. The key will be to see if they score fewer than 17 against MSU and 7 against OSU. If that happens, I will concede your point.